This morning I had to pull myself out of the daze of Spring Break and admit it was time to plug back into my routine. I did the best I could to prepare the night before: I cleaned my room, I made sure my daughter’s favorite dress was in the wash for tomorrow, and I went to bed early. I rolled out of bed at 6:40am to get a little quiet time with Jesus before I welcomed my before/after school care kid at 7:20. By the time my kids were up, I was filled and ready to meet their needs―breakfast being one of the first. I gave my middle child an option of toast or cereal (I may have neglected to go to the store, so it was slim pickins). She chose toast and sat to eat…moments later she declared she didn’t like the bread I had toasted. (Who doesn’t like cinnamon raisin?!) My response was better than it had been in the last few weeks. I simply asked if she wanted cereal or yogurt and fruit. She quickly said yogurt and fruit. I proceed to get that out and place in front of her. It is a mere moment before she is rejecting this breakfast too. This is where I want to lose it! I still haven’t had a chance to eat anything myself. I am also buzzing around the kitchen packing three lunches and making sure 2 of the four children are completely ready to meet the bus coming in 15 minutes. I take a breath, reiterate that she chose this breakfast and I would like her to eat it. She is now quietly pouting at the table. Thankfully for her, if the attitude had kept up, I may have had a meltdown before 9am. I decide to keep on my task and not worry about whether she eats or not. At this point, she has had 2 opportunities to eat and maybe she will learn her lesson. Suddenly, I hear a quiet voice from the table. This. This is a sign that it isn’t about the thanklessness. I chose a less reactive path and in my patience, this is what I got. I turned to her and thanked her for her kind words. I also allowed her to get up from the table. She chose not to eat, which is part of all of this mothering thing. I know she will be hungry earlier than normal, but she will have to wait to eat with everyone else at preschool lunch. She has to learn to make choices. She needs to learn that she has control over her reactions to situations. At five, I get to determine which scenarios I am going to pull back from and let the chips fall where they may. The stakes are low when it comes to a little missed meal. If I would have leaped in and forced her to eat simply from the fact she chose those foods, I would have missed out on the last bit of this event. Her own change of heart. This phrase she said to me goes back to a time when all three of my children took turns complaining about every single meal we had. It seemed no matter how delicious or kid friendly the meal was, someone had a complaint and it usually flew out of their mouth before taking a single bite! The thanklessness in the meal department had reached an unbearable high. Sad to say, I lost it one night. There was crying screaming and maybe even plate taking―I can’t say for sure. I wished I had simply excused myself and hashed it out with the Father, but there is always hope for the next opportunity. After the meltdown, we enforced a new precedent. All three children were asked to thank me for preparing a meal for them before we ate that meal. This simple declaration has changed our dinners drastically. Sure I still have a child here or there who doesn’t like the meal, but they don’t blurt out how yucky it is or that it smells awful before even trying it. 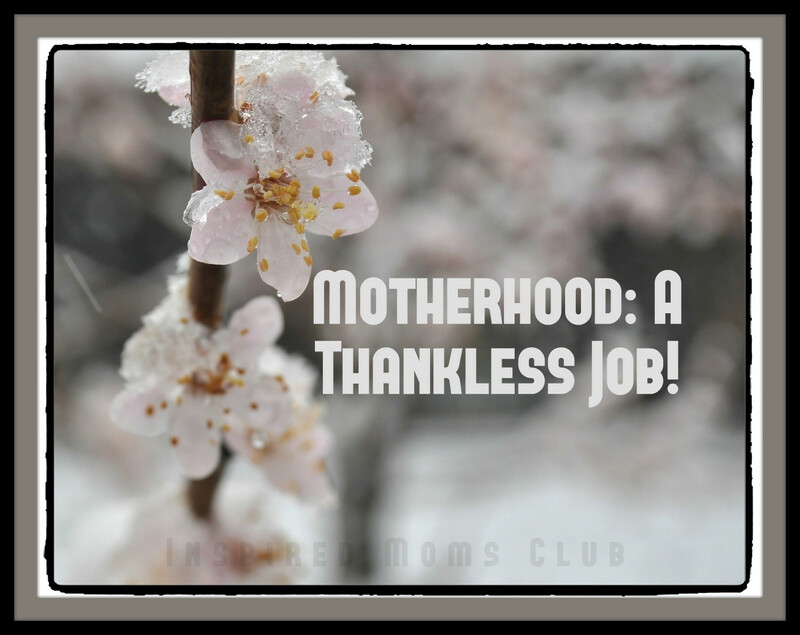 If motherhood is a thankless job, try to teach gratefulness. They need to be taught and it needs to be modeled. How else will they learn to see and appreciate the acts of kindness that go on in their everyday life? I am training up gold spotters. I want them to search for the good in situations and people. Seeing the negative is easy―seeing the positive takes skill. I want skilled encouragers. Let’s start with them appreciating the things mom and dad do every day. Also, I thank them for what they do. Even if it is something I asked them to do. What ways do you build up your kids? What areas do they struggle with negative outlook or bad attitudes? What have you done to curb the atmosphere of thanklessness in motherhood?